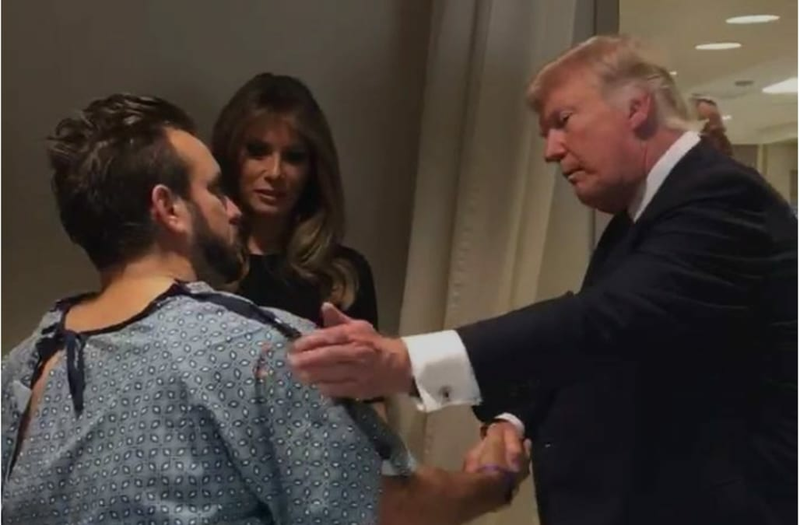 When President Donald Trump toured a Las Vegas hospital after the deadliest mass shooting in living memory, 28 year-old Thomas Gunderson pushed through his injuries to stand up and shake his hand when he entered his hospital room. Gunderson, one of more than 500 injured in the mayhem of the Sunday night massacre, posted a video of the interaction on Facebook where he commented: "I will never lie down when the president of this great country comes to shake my hand!" Gunderson was recovering from a fresh gunshot wound to the leg. "Hey, this guy looks tough to me," Trump said as he entered the room.